After four days, as boats slowly took the opportunity to slip out of Hobart's Sullivan's Cove and head for their respective homes, I was reminded of the seminar Lin Pardey gave during the MyState Wooden Boat Festival symposium. Sponsored by the Australian National Maritime Museum, the symposium was a perfect adjunct to the display of wooden boats outside at Hobart's waterfront. Lin's presentation was titled 'Love or logic' and weighed up the factors that can make a wooden boat restoration a success., "boat festivals keep wooden boats alive," she said spreading her arms in the direction of the festival, "but boats can keep communities living." Considering over 220,000 (number to be confirmed) people had wandered through this vast festival over the past four days, Pardey's comments were certainly prescient. Australia's biggest boat show in Sydney is pleased when it reaches 60,000 for the four days it is open in August. So, for the small city that is Hobart, to see nearly four times that amount saunter dockside, viewing such an esoteric object as a wooden boat, is quite astounding. Given the full support of the Tasmanian government and sponsorship from the major corporations of that state, the MyState Wooden Boat Festival is open free of charge to all. It is now the largest event held in Hobart and possibly the state. More food stalls than the 'Taste of Tasmania', more wooden boats than any other festival around the world and more boats and visitors from around the world as well. Besides the symposium on all things wooden boats, there was a children's park with continuously running entertainment, a maritime marketplace with over 160 exhibitors willing to discuss, food stalls galore, a shipwright's village, model boat display and much more. Of course there was 450 different wooden boats for you to drool and gawk over as well. From the tall ships of James Craig and Tenacious down to meticulously veneered rowing skiffs. A contingent of six students from the Netherlands have been living in Hobart for ten weeks and constructed a classic Dutch small yacht out of Huon Pine timbers recovered from the bottom of Lake Pieman on Tasmania's west coast. Hydrowood is a relatively new company that is salvaging trees that have been under water for thrity years since they were flooded during the construction of the hydro scheme. The wood has been tested and the Dutch boatbuilders were all enamored with using it to construct the beautiful BM16 square metre. Big boats took passengers for a taste of the olden days and the Parade of Sail ensured the waterfront from Wrest Point Casino to Sullivan's Cove was packed. This massive event is already taking bookings from interested wooden boat owners. If you wish to visit the next festival in 2019, I suggest you get planning now. 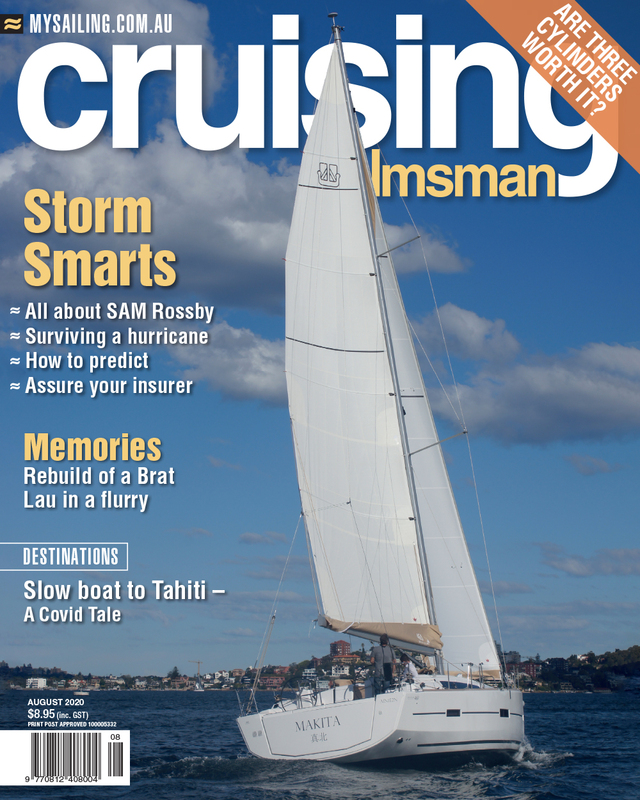 There will be a full report in the May issue of Cruising Helmsman.